All Loreto Schools in India belong to the Institute of the Blessed Virgin Mary founded in England in the seventeenth century by an English woman named Mary Ward, and later carried over to Ireland by a young Irish girl, Mary Teresa Ball. 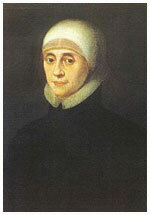 MARY WARD (1585 - 1645) was the foundress of the Institute of the Blessed Virgin Mary , a religious order which is now spread all over the world and which engages mainly in the education of girls. The 'Loreto' nuns are those who belong to the Irish branch of the Institute. There is one other branch, commonly called the 'Roman branch'. Mary Ward was English and lived during a time of great persecution and hardship for those who remained true to the Catholic faith in England. As a young girl Mary wished to give herself to God as a nun, but all the convents in England had been closed down. She therefore sailed to France and became a novice in a poor Clare convent where here main life's work would be to pray on behalf of those who were in need of God's special help. After some time, however, God revealed to her that her life was to be spent, not in prayer only, but in action also. She gathered a group of other generous and spiritual young women. In 1821 an Irish woman called Mother Teresa Ball founded the first house of the Institute in Ireland and called it "Loreto House". From here in 1841 a group of nuns led by Mother Delphine Hart brought the Institute to India, and founded Loreto House, Calcutta. Let us Mary Ward's spiritual children, get to know her life and strive for the ideals she placed before us by her life, words and deeds-ideals of goodness, sincerity, courage, joy in service and love of the poor. Today, spread across the world, we have many students, staff members and hundreds of thousands of pastpupils across the world who share a common identity and a strong sense of belonging to one international family through our founder, Mary Ward.